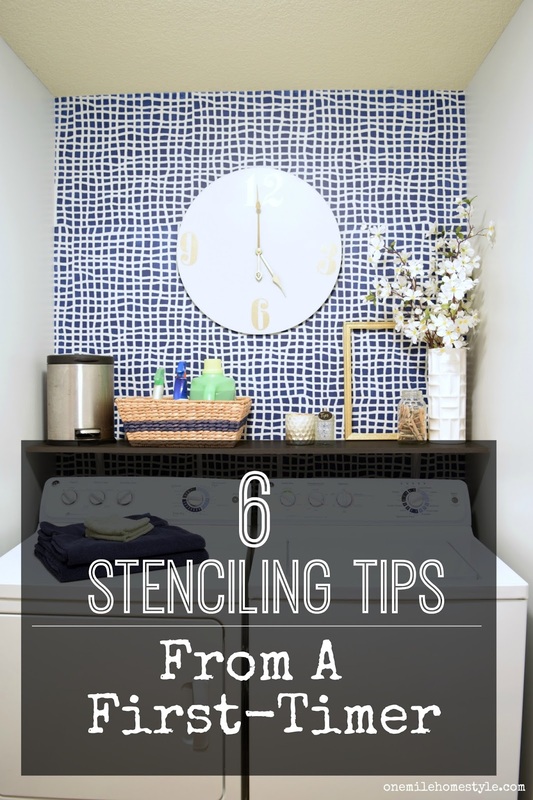 So, last month I tackled my first big stenciling project, and gave our laundry room a fun makeover. And now, I am elbow deep in another stenciling project in our master bedroom, I think I am just a sucker for painting projects! Mid-way through the laundry room painting I started making some mental notes of things I was learning, and things I wish I would have known before I started this project. That's not to say that I'm not happy with the result, I absolutely love how it turned out, it was just some parts were not as simple as I thought I was going to be. 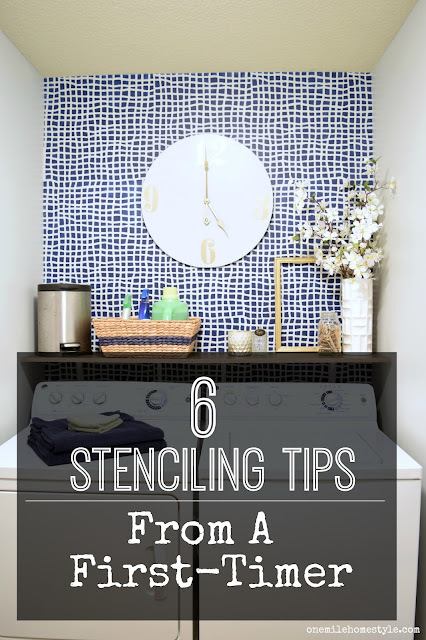 So, to save you some of the stress, and make your next wall stenciling project a little easier, here are my wall stenciling tips from a first-timer. 1. Start in the top left corner and work your way across and down the wall. This tip is especially important if the stencil you are working with has an additional top edge stencil. This method only leaves you with one corner and the floor trim to bend your stencil around. Let's just say I learned this lesson the hard way, which is why it is number 1. 2. This goes without saying, but less is more when it comes to paint. Dip or roller or brush in paint, and then roll or brush most of it off onto a paper plate. Too much paint is a one-way ticket to getting paint to bleed under your stencil. 3. It's not going to come out perfect! 4. Painters tape and artist brushes are your best friends. Painters tape is a must have to attach you stencil to the wall, and it makes it easy to re-position your stencil until you get lined up just right. Artist brushes are perfect for touch-ups if you do have a noticeable area of paint bleed, and they are also perfect for filling in stenciled areas that are close to corners/ceilings/floors. 5. Give yourself plenty of time. I would suggest adding another hour (or two) to the amount of time you think you will need to complete your wall. I thought the laundry room was going to be a quick Saturday project, well...it took a couple hours longer than I thought. You need to allow for paint to dry before you overlap the stencil, and depending on the wall size, you may need a drink break to rest your arm. 6. Think contrast, and don't be afraid to go BOLD! The thing you must remember when stenciling is the bigger the contrast, the bigger the result. Our laundry room mixes light grey and a bold navy blue, and makes a huge statement in the small space. You can also contrast with paint sheen; a flat base paint paired with a high gloss in the same color can have a dramatic result as well. I would love to hear if you have any stenciling tips of your own. It's definitely one of those painting techniques that takes some practice (and patience). Stay tuned to see the results of the wall I am stenciling in our master bedroom! Thank Anika! #3 was probably the hardest one for me!